Try starting with Starry Night , where students can measure the period and angular velocity of an object that does not complete one rotation. This could be done as homework, but we usually do it in class as introduction to rotation with students working together on white boards. The activity takes about 15 minutes to complete. The video is beautiful and engaging, with satellites visibly streaking across the sky near dawn. Most students are surprised when they convert the period into hours and then realize the cause of the apparent motion. 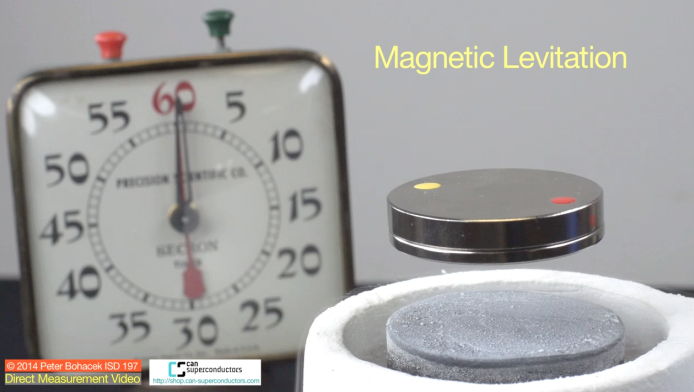 To introduce the concept of angular acceleration, ask students to analyze the motion of a Rotating Levitated Magnet. This is another short activity, also about 15 minutes, that we usually do in class. Everyone is fascinated by levitation, and students are usually curious to learn how long the magnet will continue to rotate. The video allows viewers to make measurements of the changes in angular speed of the disk over a 15-minute interval, allowing students to answer that for themselves. In the process, they usually calculate the angular acceleration without realizing it. During white board discussions, when we see a student who has divided the change in angular speed by the time interval we ask, “What is that quantity?” Students usually describe angular acceleration, but without knowing the name. This is our favorite way of defining a quantity: students discover it while analyzing, decide it is useful, and then learn it already has a name. As a follow-up question, ask students how many rotations the disk made during the 15-minute slowing-down period. It’s pretty neat that they can use their favorite kinematics tools again for these rotation situations. Students in AP Physics students must master the relationship between the angular motion of a rotating object and the linear motion of a point on the object. We have two video activities for this. 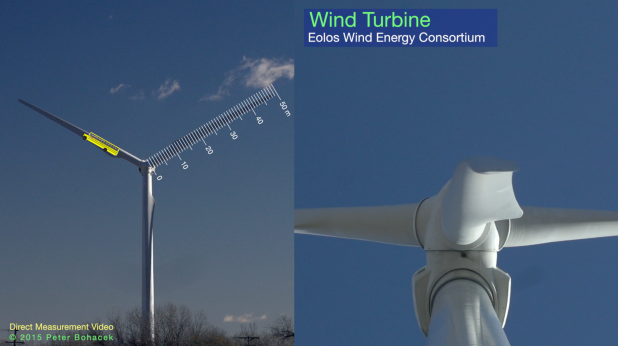 The Eolos Wind Turbine video allows students to measure the amazingly high blade-tip speed, and to see how staggeringly large wind turbines are by comparing the length of the rotor blade to the size of a school bus. 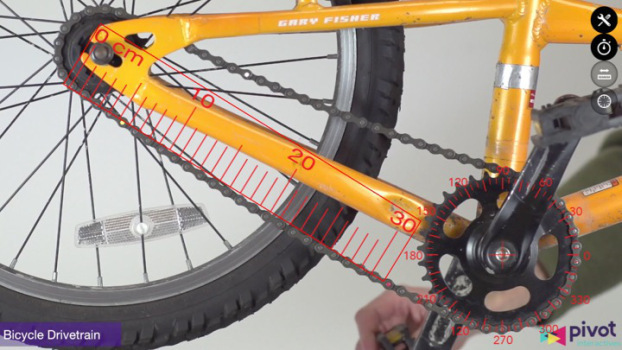 The Bicycle Drivetrain shows students that the tangential speed of the front gear (aka chainring) is the same as the tangential speed of the rear gear (aka sprocket). Both of these are short interactive activities that can be done in class or for homework, each taking 10-15 minutes. For a more advanced option for applying Newton’s Second Law for rotation, we also have video activities of various wheels accelerated by objects suspended from a string wrapped around the wheel. One option has multiple Wheels each with various weights hanging from strings wrapped around the perimeter. 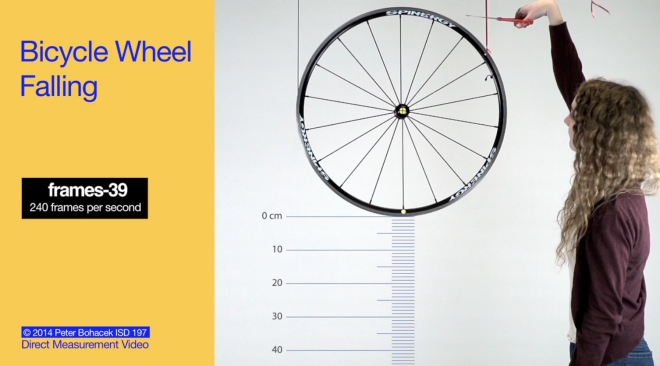 This activity allows many different paths to finding the rotational inertial of high-tech bike wheels. Another allows students to predict the mass of an object hanging from a string wrapped around the perimeter by measuring the acceleration of the wheel after the object is released. Finally, students can analyze various Falling Wheels with strings wrapped around the perimeter and attached to the ceiling. Each of these can be completed in class or for homework. All of them take about 30 minutes to analyze the motion of a single wheel/weight combination. If you or your students are looking for an even greater challenge, try Sliding to Rolling Transition where students can apply linear and rotational dynamics and kinematics together. The videos of objects rolling on ramps will help set the stage for analysis of objects accelerating as they roll. To practice creating argument from evidence, try Exploring Factors that Affect Acceleration on a Ramp, where students can discover whether mass, radius, and mass distribution affect the rate of acceleration or the final velocity. Videos of Water-filled Disks rolling down a ramp are another opportunity to practice creating arguments from evidence. We also have several useful options for learning about angular momentum. For angular momentum of a rigid rotating object, students can analyze a simple rotational collision between a stationary disk and a rotating disk. Analyzing the total system angular momentum before and after the collision gives convincing evidence that angular momentum is constant during these events. A variation on this theme allows students to determine the Rotational Inertia of a Non-Uniform Object using the assumption that angular momentum is constant during this rotational collision. Use these to calculate the linear momentum of the marble-block system before and after the collision. Students will find that the values are close, indicating that linear momentum is indeed constant for this collision. Calculate the angular momentum of the wood block after the collision. Now, ask students: where did the block get the angular momentum? This is an ideal time to introduce to concept of angular momentum of a particle. The video array in this activity also allows students to vary the location where the marble hits the block and observe how this affects both amount and direction the resulting angular momentum of the block. The array also includes videos showing a marble blasting through an aluminum pop can. These videos can be used to determine the rotational inertia of a pop can. For the interested reader, here is a photo of the lab set up for the marble-block collisions videos.We used a pneumatic marble launcher built entirely of pressure-rated pvc pipe, pressurized by a bicycle tire pump. The launcher is triggered by a solenoid-actuated sprinkler valve. 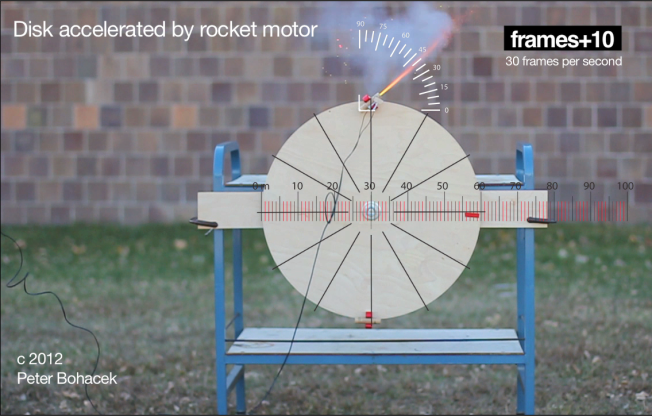 This launcher is too dangerous to use in a classroom. We recorded these events with the Edgertronic high-speed camera, with exposure time of less than 1/20000th second to minimize motion blur. Such short exposure times necessitate powerful lights, as can be seen in the shot. We recorded many hundreds of shots (and lost almost all our marbles) to get the good ones shown in the array. 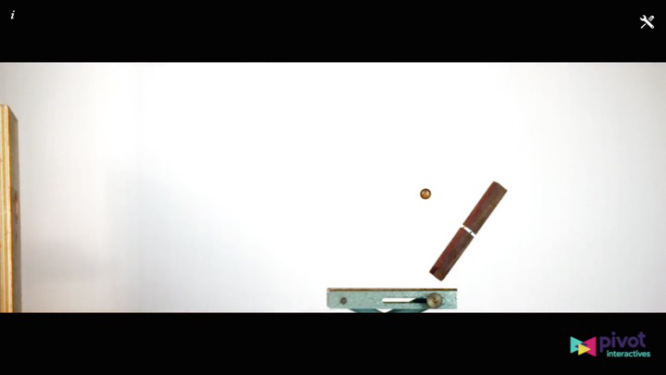 Another recent addition to Pivot Interactives is this set of videos of a Blow-Dart Fired into a Wooden Stick mounted on a low-friction bearing (actually an old skateboard wheel). In this set, students can see that the angular momentum of the dart before the collision is very close to the angular momentum of the dart and stick after the collision, while the linear momentum of this system is not constant at all. These video-based activities can supplement the apparatus-based labs, simulations, and word-problems to make a rich, engaging, comprehensive, and effective unit on rotation.